In general, artefacts made of calcite marble outnumber by far the works of art made of dolomitic marble. Well known are the dolomites of Saliara and Cape Vathy on Thasos, and many researchers consider these marbles to be the only reasonable source for high-quality dolomitic marble used for sculptural purposes or for decorative architecture in antiquity. Lazzarini (1987) referred to fine-grained dolomitic marbles from Crevola in Italy (today sold under the trademark Pallisandro) and also at Drama in Eastern Macedonia, and argues that these sources for dolomitic marble were of very limited importance if at all used in antiquity. Barbin et al. (1992) report about the occurrence of dolomitic marble on the island of Naxos. The dolomitic marbles from Macael (Almeria/Spain) reported by Barbin et al. (1995) also seem to have been only of local importance. Lapuente and Blanc (2002) and Beltrán and Loza (2003, 2008) mention dolomitic marbles in the Malaga province of Spain. The dolomitic marbles we are dealing with here cannot be confused with the coarse-grained Thasian dolomites which were frequently used in antiquity (several papers by J. Herrmann). During the last years I found several locations with occurrences of fine-grained, very white dolomites. 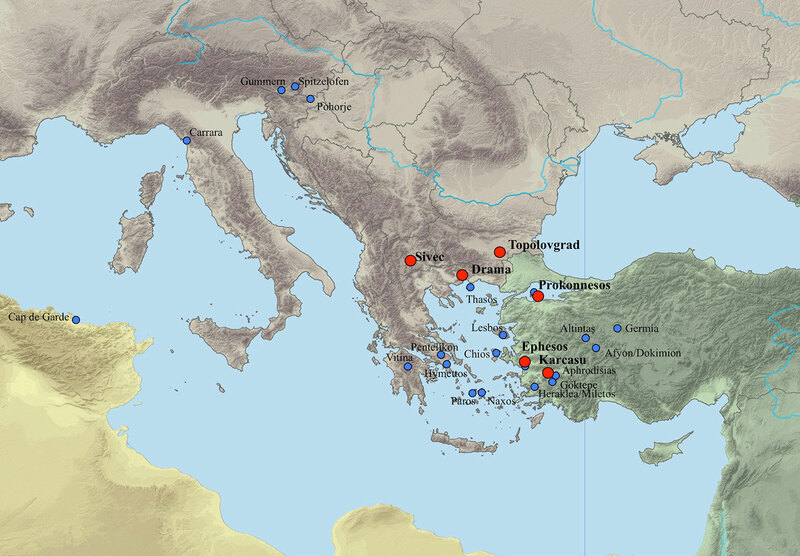 The most important so far are the Sivec dolomites close to the town of Prilep in Macedonia, further occurrences can be found near Belevi/Ephesos, Prokonnesos, Karacasu near Aphrodisias, Drama in Greece and Topolovgrad in Eastern Bulgaria. Locations of fine-grained dolomite occurrences (red dots). Petrographic features of the investigated dolomites are very similar and differ substantially from those of the Thasian dolomites. 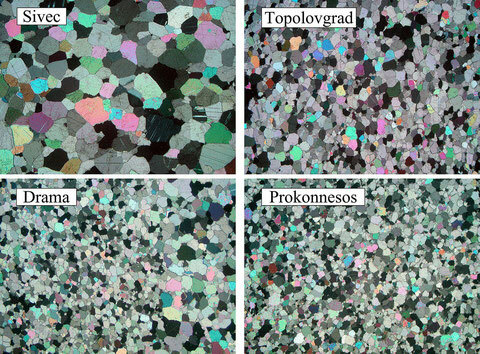 All fine-grained dolomites investigated here exhibit MGS (maximum grain-size) below 1 mm. Texture is very regular-mosaic with straight grain-boundaries. Microphotos of different fine-grained dolomites. Image length in all cases is 7 mm (polarized light). Microphoto of fine-grained Prokonnesos dolomite. 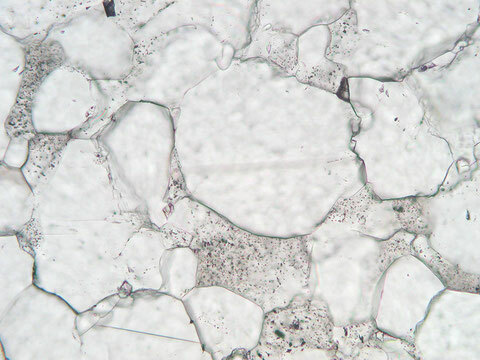 Idiomorphic, very clear and slightly rounded dolomite blasts occur in a calcitic matrix. Fluid inclusions in the calcite groundmass are obvious (lenght of image is 0,7 mm). Multivariate discrimination of the investigated dolomites and the projection points of some examples of investigated artefacts. For the occurrences of dolomitic, fine-grained marble in Drama, Ephesos and Karacasu no corresponding artefacts could be found so far. 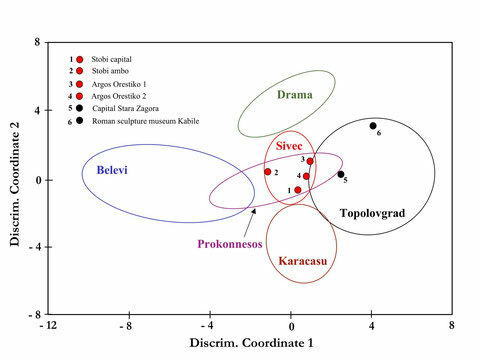 Artefacts and architecture from the high qualitiy dolomitic marbles of Sivec (Stobi) can be found all over Macedonia and in northern Greece. 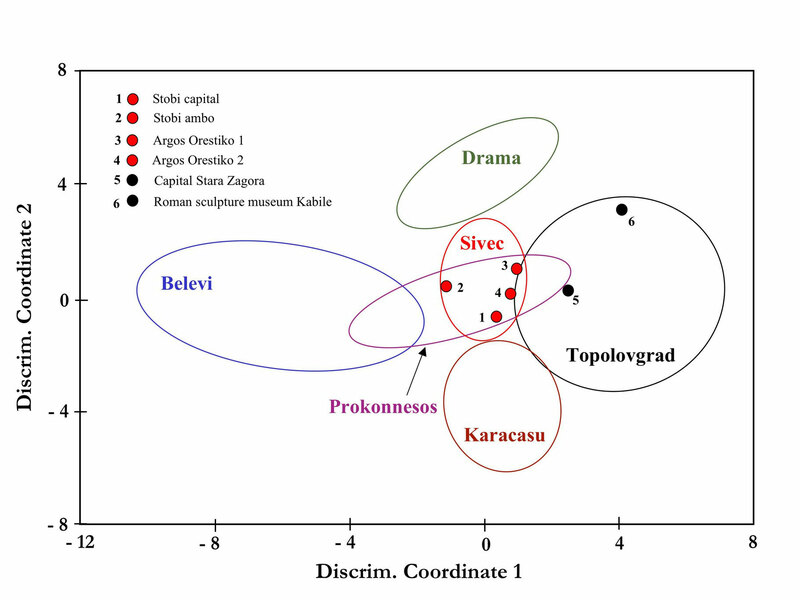 Some sculptures and votiv-plates in Eastern Bulgaria, however, could be assigned to the Topolvgrad dolomites. Niewöhner Ph. und Prochaska W., 2011: Konstantinopolitanisches Formenrepertoire in Mazedonien - Zur Bischofskirche von Stobi und den Marmorbrüchen von Prilep. - Istanbuler Mitteilungen 61, 433-439. Prochaska W., 2013: A sculptural marble of prime quality used in antiquity - the dolomitic marbles of the Sivec mountains in Macedonia. - Archaeometry 22 (2), 179-197. Prochaska, W.: Fine-grained Dolomitic Marble of High Quality Used in Antiquity. - Proceedings ASMOSIA X, in print.